The Deschutes jasper comes from a zone located at the east of Biggs Junction, in the state of Oregon, USA. Its name comes from a close river named Deschutes. This variety of picture jasper is no longer excavated because it can be found in a national park but most of it is under a highway. It is quite similar to the Biggs jasper that knows the same excavating problems. However, the Deschutes jasper is famous for its landscape patterns which are more detailed. The Deschutes jasper can generally be found in hues of brown, reddish brown to cream colors. It can also show blue grey colors. 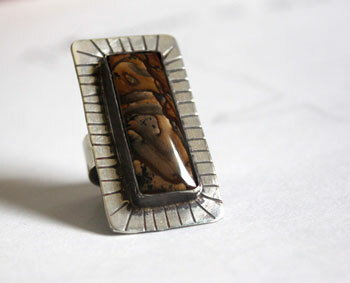 This jasper often shows a desert landscape with a blue sky. The Deschutes jasper, like the Biggs jasper, became famous because of road repairs that were made due to a flood in 1964. It has the same properties than the picture jasper. The Deschutes jasper is recommended for kidney problems.